with the best of southern traditions. If the planted loblolly pines and oak trees could talk about the farm life of days past, the tales would be rich with Troup County heritage. An area that was once inhabited by the Creek Indians, in 1825 Georgia Governor Michael Troup was permitted to subdivide this Creek territory into five counties, one of which was named Troup. In 1827 Troup County officially became a settlement and a year later LaGrange was incorporated as the county seat. LaGrange’s strong history is plainly acknowledged in the town square by a statue of General Marquis de LaFayette, a hero of the American Revolution who visited the as-yet unnamed county seat in 1826 and remarked that it reminded him of his estate LaGrange in France. Other historic legends also thrive, such as that of the Nancy Harts, the only female commissioned regiment. They are credited for “saving” the town during the Civil War by confronting a Union Army invasion when the captain refused to fight a battalion of women. Troup continued to grow after the Civil War and by the turn of the century the textile industry had become the business foundation. The new cotton mills brought in sharecroppers seeking a better way of life. The character of the property at Retreat comes partially from sharecroppers from the 1900’s who created the terraced hills and from the 1975 formation of West Point Lake, a 26,000 acre lake managed by the Corps of Engineers. LaGrange continues today with the rich heritage that was created by the people of yesteryear. People like the rags-to-riches story of Fuller Callaway, founder of Callaway Mills; and the achievements of artisan Horace King, who traveled up from slavery to become one of the most respected designer and builder of covered bridges in the Southeast. Textiles are still present but new additions such as the KIA manufacturing plant have added a diverse flavor to the area. 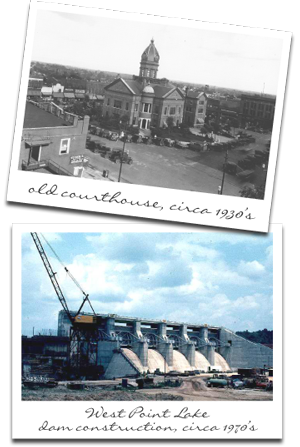 For more on the history of Troup County and the city of LaGrange please visit the Troup County Archives.